Your bulky electric food processor is noisy and takes up too much counter space. 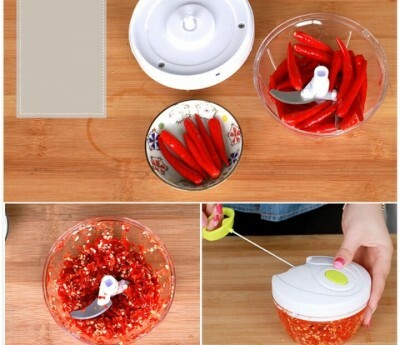 Crank Chop is a compact, manual food processor that does not require electricity. 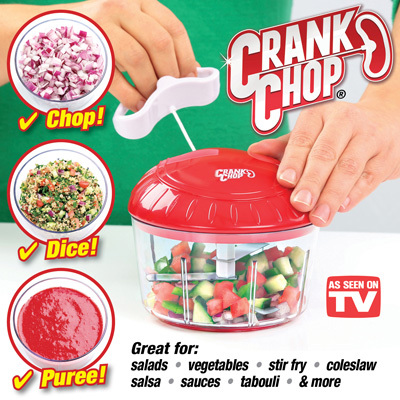 Chop, dice, and puree with a pull of the cord! Make salads, salsa, tabouli, stir fry, and more with ease. You can even make homemade baby food! Crank Chop measures 5-inches by 5-inches by 5.5-inches. So, it is small enough to stash in your drawer or cabinet when not in use. 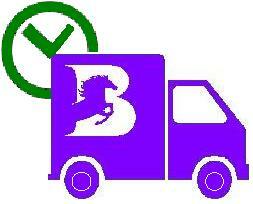 Take it along camping, in the RV, work, or the college dorm. 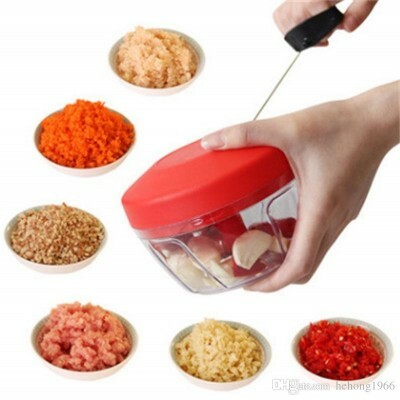 ALL-IN-ONE HAND-HELD FOOD CHOPPER: The vegetable chopper that chops, dices, and purees with a pull of the cord, replacing your dicer, mincer, cutter, and blender. Small enough to take in the RV, on camping & fishing trips, or use in the dorm. 3 POWERFUL BLADES: Three powerful blades that simultaneously slice through food with each pull of the cord. Pull it a couple of times for a nice dice, or several for a rich puree. EASY TO USE: Just place ingredients like onion, garlic, tomato, nuts, or any veggie and herb into the bowl, replace the lid, then pull the cord to start chopping. The more you crank, the finer the chop. 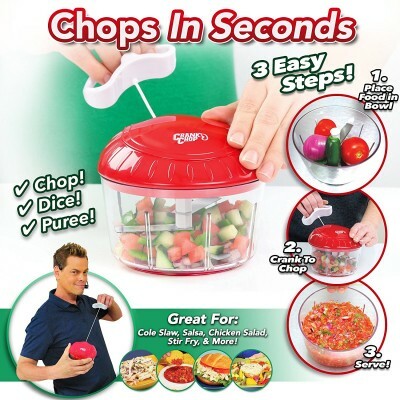 GENEROUS CAPACITY: The pull string chopper has a generous 2-cup bowl capacity that's perfect for your finished chopped salad, guacamole, salsa, and more. 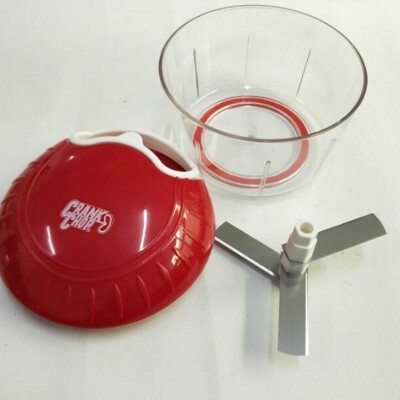 CLEANUP IS EASY: When you're ready to wash your handheld food chopper, cleanup is a cinch. 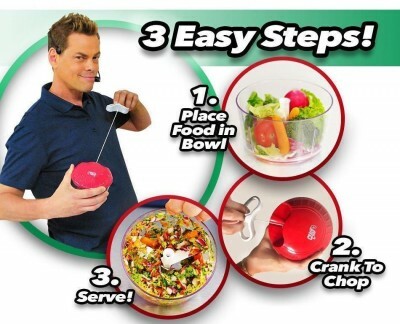 Both the bowl and blades are dishwasher safe. Lid requires hand washing. 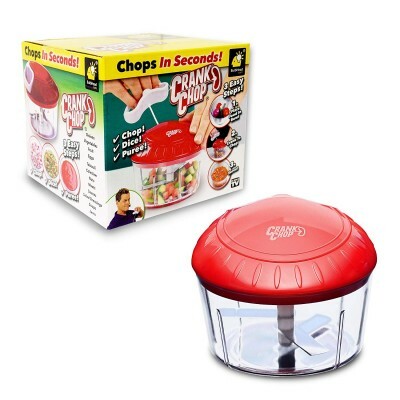 Includes Crank Chop, lid, blades, and protective blade cover. Product Dimensions : 5.6 x 5.1 x 5.6 inches.